In the pre-war period, when Pablo Picasso was carried away by surrealism, embodying in it his violent fantasy that could not be described, a color graphic image appeared under the simple name “Rooster”. The picture is painted in the style of expressionism, drawing the eye to the rough graphic image of the poultry in bright colors, showing extraordinary beauty and at the same time inherent dullness. The picture is made in rich, colorful colors, where each part of the rooster is carefully traced. After studying the picture in more detail, you should pay attention that the artist resorted to another genre, using cubism in certain elements. The rooster stands, opening the beak, in which you can see a long tongue. Details of the head of the rooster and the scallop are traced in rich scarlet. Bird feathers covering all small bodies are highlighted with large strokes of bright contrasting colors. On the legs of the rooster stand out sharp spurs, which he proudly demonstrates to the viewer. The background is simply and uncomplicated, the artist decided to decorate it with smooth beige divorces, which, with their indiscretion and fading, make it possible to further highlight the beauty of the main image of the vociferous bird. Working on the painting “The Rooster” Pablo Picasso sought to show all the luxury and at the same time the absolute stupidity and aggression inherent in this bird. The artist portrayed it without unnecessary details and complex strokes, also without using the play of light and shadow, however, the picture is so eye-catching that it has become one of the most recognizable works of the eminent author. 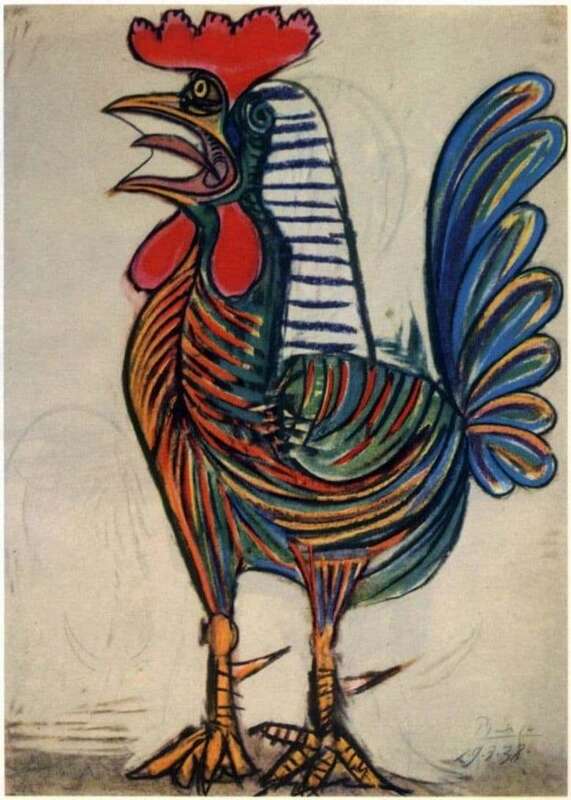 Pablo Picasso created a whole series of paintings, the main character of which was directly the rooster. These works are attractive for their unobtrusive simplicity and at the same time, bright modern originality, inherent only in the works of Picasso.